"One of the most powerful things you can do for spiritual advancement is a sleep meditation". Your sleeping hours can be a time of your greatest advancement. This sleep meditation is a practice that is not very known. And no matter how busy our lives are, we can always create the time and space to fall asleep in a conscious state. It can help us in our daily life far beyond what we can comprehend with our mind. It is one of the most powerful things that we can do. It does not take any extra time in our life, but is requires consciousness, focus and desire. It is something that requires our conscious mind to really grasp a hold of. A sleep meditation is a very basic spiritual practice that you can incorporate into your life. It takes little bit of time to really have this practice become very natural in your life, but at a certain point, it will. If you have children, bring this teaching to them! Meditation for children is easy and fun to do. How does a sleep meditation work? At night while we sleep there is a part of us deep within that does not become unconscious, and that part of us is being attended to by a benevolent spiritual presence. Also at night the veils of illusion and our ego is not so densely present and therefor the help, guidance and power from the true realm can be of greater assistance. The full benefit of what can go on at night during our sleep hinges strongly upon the state we fall asleep in. One way...we can fall asleep unconscious, it's like going to bed and hitting the pillow and boom, we are gone. Or we are laying in bed and our mind just goes a million miles an hour and it never seems to stop and somehow we fell asleep in the middle of it. The other way...when we get to bed we focus on our heart. We focus on a thought of gratitude, a feeling of desire in our heart, a prayer or a question maybe. We close our eyes with the focus on this thought and feeling; this way we enter our state of sleep in a conscious way. The perfect start for a sleep meditation. How to best prepare ourselves for a sleep meditation? In order to connect to the right state of consciousness inside of ourselves it helps to prepare the way. Complete your day as best as you can. Tie up any loose ends, for instance check your to-do list and see if all is attended to. Is there anything that needs to go to a future list or do you need to make a call or write an email to complete something or know when the next action to take is. Put all your belongings in their proper place. Try to feel finished with the day. This way you will feel less distracted when preparing for sleep. You just feel ready to go. As you go to bed, do your things you normally do to prepare for sleep; shower, brush your teeth, your hear, your beard, toilet etc. Then as you get into bed, I suggest you sit up first. Have a notepad and pen with you and write down any last things in your mind that you are trying to remember or that in someway pull on your attention. Once they are written down you can let them go as they will be there for you once you wake up in the morning. If your mind is really busy and so full then do this pre-meditation exercise to achieve a calm mind. Once you are ready, sit up in bed, close your eyes. Bring you attention to your heart. What in the deepest part of your heart is important for you? What is your deepest hearts desire? And now with an openness and recognition that there is a benevolent Source that connects us all let this feeling and focus in your heart be as strong as you can let it be. Lay yourself down on your pillow and let this focus and feeling in your heart be the last thing you were aware of before falling asleep. 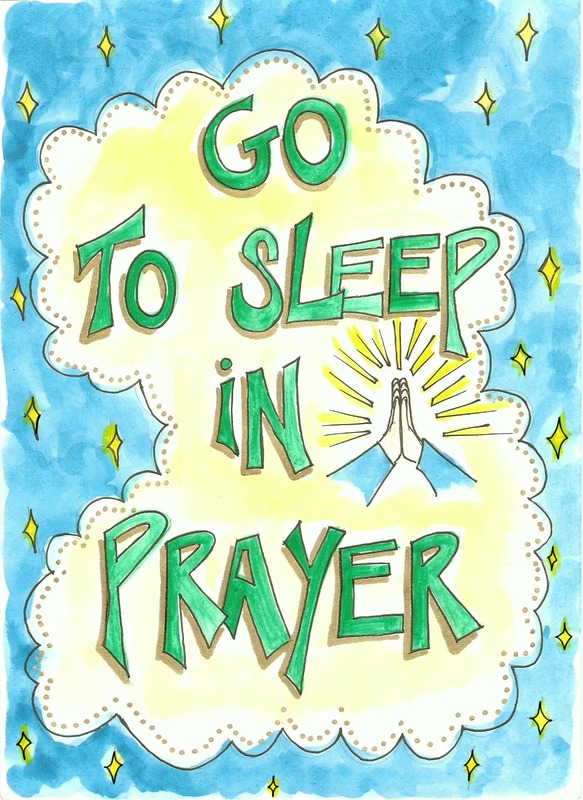 You went to sleep in a conscious state of prayer. Well done! It might be helpful to do a guided meditation for a couple of times till you feel confident you can do it on your own. The following guided sleep meditation is for you. Better, deeper and more peaceful sleep. The deeper you can sleep the more restful you feel the next day. Some People said they need less sleep. Many people see the "Lightbeings", a host of our True Selves that hoover presently around the earth to help us. Many people get the answers to their questions by the time they wake up. You see when we’re sleeping, is when the information comes to us. For many different things. It just like drops into our consciousness when we’re asleep. Information regarding everything that we need to know. People that pray sincerely to be free from something in their consciousness feel lighter and stronger at the same time to face their obstacles and mostly know what they need to do to free themselves. People said they feel more ready when they wake up to start the day. You may not remember in the morning because the true evolution of your awareness is beyond your body and mind. But if you will pay attention to your state of awareness before you fall asleep and again pay attention when you wake up, you will be able to see a difference, an increase in your awareness. "Just see how much society could raise its consciousness with no loss of waking time, how much this world would change if this one principle gets out and is properly taught and people properly capture it and properly practice it. What a magnificent difference it would make to the world"